People often think that Google Wallet is the first thing that adopted the NFC Technology for the payment system. But there are few other app developed which support the NFC. The NFC tags are the best thing available in the market where you can assign your task to it. These NFC tags are one such when your phone gets connected to it, the task assigned to it is automatically performed. If you are in search of such NFC application then here is the list of Top 5 NFC Apps available on Google Play Store. 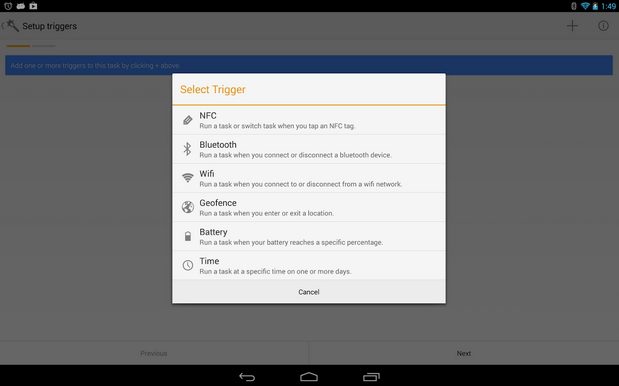 The Trigger is most powerful Android app that allows you to perform numerous tasks and scripts on your smartphone based on the variety of triggers like NFC tags. These NFC tags are helpful either by changing your sound profile or else connecting or disconnecting the Wi-Fi. 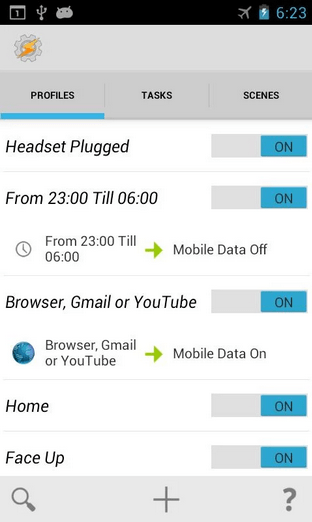 It interacts along with your surroundings to configure settings on your phone automatically. Innovative users can perform a wide range of tasks using the NFC tag, such as you can turn your phone to silent mode by placing the phone on the NFC tag at your work desk. While traveling in car Bluetooth can be used as a trigger to turn off Wi-Fi, open GPS and launch your favorite music app. Tasker is one of the best Android automation tool, along with Trigger. 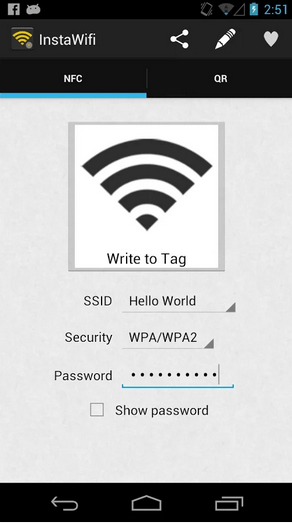 This application has the additional locale NFC plug-in, where a user can use NFC tags as Trigger to initiate tasks of the Tasker. It is one such app that performs complete automation from settings to SMS. Various triggers of this app include time, day, location, widget, timer, plug-in. This app helps in designing your screen overlays. The app has four ribbons in the menu tab, i.e., Profile, Tasks, Scenes, and Variables. Each ribbon holds their functions. The only disadvantage with this app is that it is a paid app in Google play store. InstaWiFi is an app that helps you to share Wi-Fi network along with friends and family instantly through the use of NFC and QR codes. In this, you can simply tap your phone on an NFC sticker or else scan a QR code to connect to a Wi-Fi. This app is only needed to generate the QR code for your Wi-Fi network, and then any smart phone with QR code reader app can scan the QR code and get connected to the network. 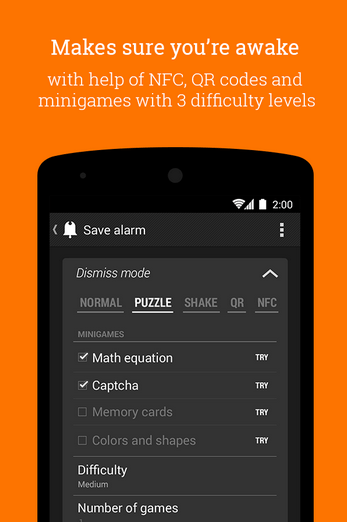 Puzzle Alarm Clock is one of the best alarm application that Supports NFC Tag option to stop alarm or else to Snooze it. Along with NFC tag and QR code, it also comes with a variety of random puzzles like a math equation, Captcha, Rearrange photos. The best place to keep the NFC tag is right next to your washroom sink so that you can start your day freshening up early in the morning. The alarm in this application won’t stop until and unless you solve the puzzle on the screen. 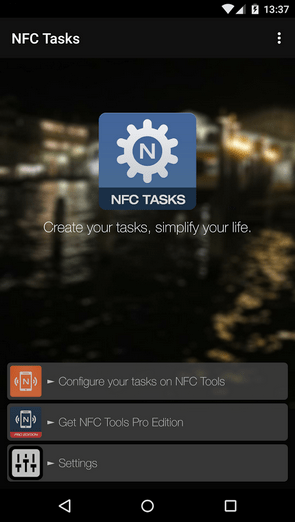 NFC Tasks is one of the apps that execute the tasks recorded by NFC Tools. This app is different from NFC Tools but acquires all the tags of the NFC Tools. The applications that are performed by NFC tasks is Configuration of the sound profile. It also set the alarm; Launch apps; configures Wi-Fi, Bluetooth, mobile data; set the volume of the alarm, ringer, media, and auto rotate.